List of Engineering Colleges In Mathura: Mathura is famous for its sweets and birth of Lord Krishna. But it is no less in education as it has many famous engineering colleges. You have come here looking for a list of engineering colleges in Mathura; then you will find it below in tabular form below. But before it lets know things about Mathura. It has a literacy rate of 72.65 percent as per 2011 census. It is famous for dental, University, and engineering colleges in the field of Oil and gas. 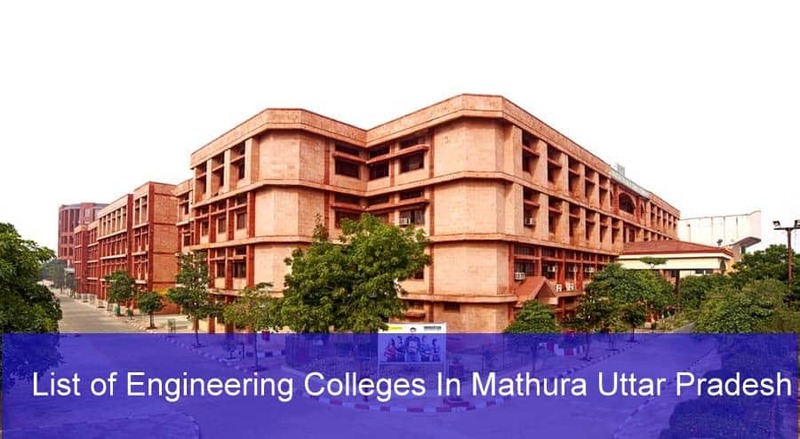 How to select the Mathura engineering colleges? Well, to pick the college you should have science as background in school and have passed JEE Main or qualifies UPSEE entrance exam. Then you need to apply for counseling rounds. Also when selecting engineering college, you should keep in mind that teaching faculty, infrastructure in the classroom, hostel, academic awards, placement records. Below is the list, but the student should note that we have not ranked any of the colleges they are in random order. We have also provided other details like the address of college, website, courses in engineering, category. You will find both government colleges & private label colleges. You should visit the online portal of college to know more about it.